Work for this exhibition was made possible by the generous support of the Pollock-Krasner Foundation. 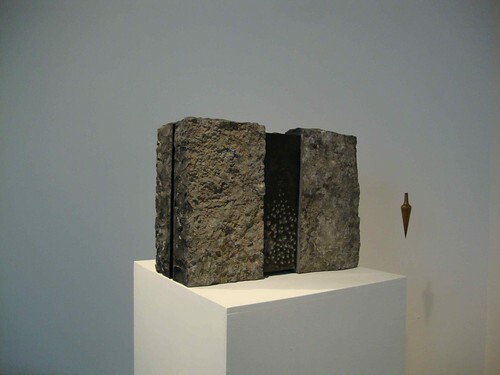 Sculpture brings into being objects which have a physical presence in the same three dimensional material world in which we live our lives, presences which we must encounter with our own in a shared continuum of space and time. 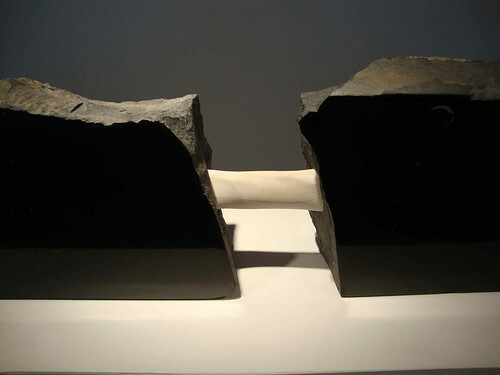 It is this very materiality which can give a sculpture its power and which can elicit a visceral as well as an emotional or intellectual response in the viewer. In this exhibition I sought to contrast the presence of an ancient and obdurate material, limestone, with the comparatively brief bloom of human being. Origin. Kilkenny Black Limestone. 2011. Human being is rooted in the corporeal. Consciousness and processes of thought flower out of an embodied or sensible world seeking to understand and articulate a presence within it. Most of the works in this exhibition constituted an ontological exploration of material and of its perceived essence. 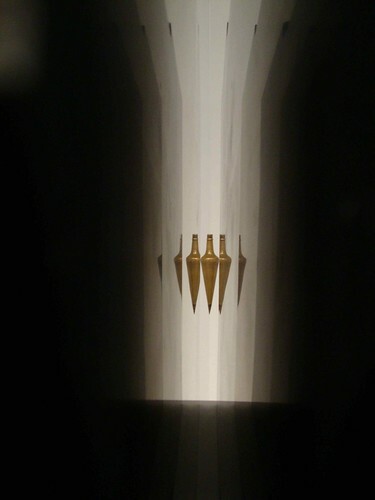 Ground of Being, Kilkenny Black Limestone, brass plumb bob.2010. 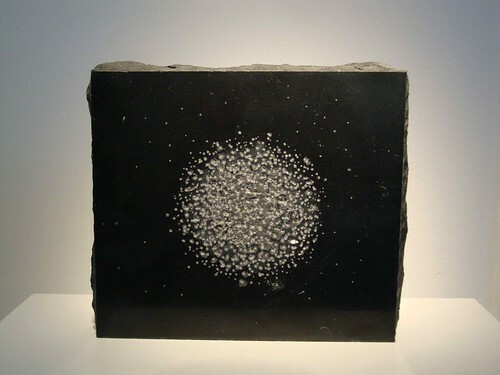 The black limestone, (more famously, if erroneously, known as Kilkenny Marble), used for these series of works offered the possibility of bringing its surfaces to a highly reflective polish. 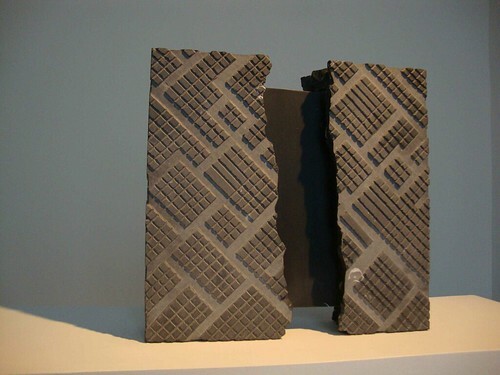 In the work, Ground of Being, this provided an opportunity to explore an inner space within the stone. When viewed through this inner space, the plumb bob, instrument of certainty, is broken into fractals by reflection, and certainty itself into partial truths. 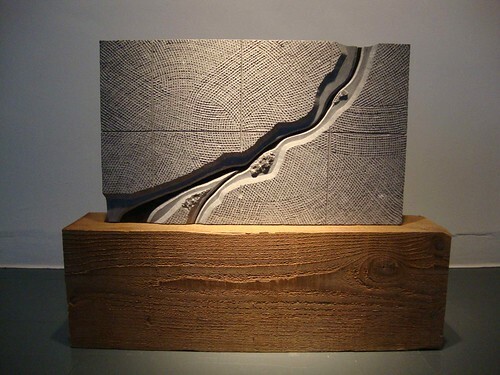 In other works such as Bridge, highly controlled and polished surfaces, offering reflected images of both the space and the viewer, were set in counterpoint to the raw heart or weathered skin of the material. 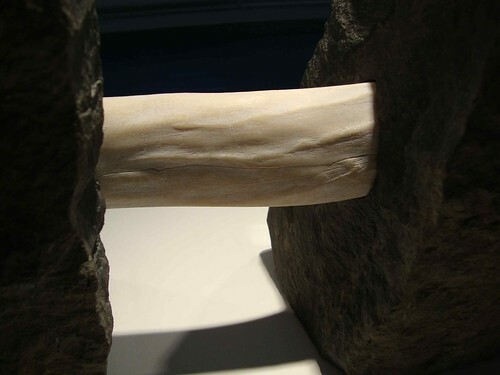 A piece of bone bridged the space, or void, between two parts of a broken stone. Metaphor allows us to see similarity in difference. It is a form of connective tissue, a bridging device that helps us to make sense of the world and is central to the life of the imagination without which we are but brute. While several of the works in this exhibition engaged with material as raw matter and sought to challenge the reflective processes of consciousness by which we impose meaning upon it, others sought to challenge those very impositions in a more overt way. In the work Overlay, a highly textured surface was broken up into cartographic grids. This ordered pattern was then destructively carved through. All human attempts to order the natural world are but an overlay on forces of which we have an incomplete understanding and limited control. Patterns suggestive of metropolitan design and urban planning were similarly portrayed and destroyed in the work, Overlay 2. Most human cultures and religions express an anthropocentric relationship to the natural world, one which holds it as other than our selves. It was the intention of these works and this exhibition to encourage reflection on this most fundamental of relationships in all of its complexity.